Now that we've upgraded to --2a, I decided to just start from scratch, and create a new repo, populate it from the official conversion, and then copy my extra revisions into it. I expected it to saturate my network link while it downloaded ~30-40MB of data, and then be done in about 2 minutes. Instead, I'm seeing very choppy downloads, as shown in the attachment. Note that I'm downloading via lp: which should be 'bzr+ssh', so it should be streaming from the remote side. I'm using bzr.dev, though, so maybe we are running into a version compatibility thing? Which looks like it is streaming as expected. I brought this up a bit in Mooloolaba. As a guess, I'm thinking that the pack-on-the-fly code may be slowing down the fetch. Even worse, it may be interacting poorly with the Nagle algorithm, so that once the pack has completed, the TCP auto-negotiation has decided that it shouldn't send as much content. It is also possible that we have some server side issues, where we aren't keeping the write buffer full. However, I would suspect the source side before I suspect the target side. 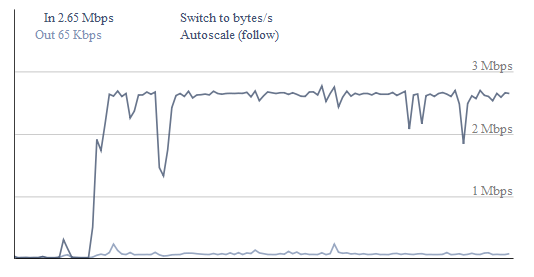 In contrast I'm uploading a picture of network throughput for iterating over 'get_stream()' from Babune to my machine. Note that it is *completely* flat. Something is throttling, though, as it transferred at a steady 100kB/s when I should have at least 300kB/s of download bandwidth. I'll try a few more tests, including checking to see what the throttling issue is, what 'branch' looks like from babune, and whether 'get_stream()' from launchpad is also as flat. I also wanted to mention that the 'dips' that are shown there are specifically in the transition from signatures+revisions+inventories => the first chk_bytes pages => the second chk_bytes pages => texts. I did test get_stream() against launchpad, and this is what I saw. 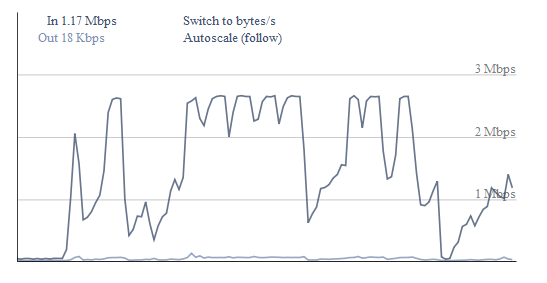 Note that the peak here is about 3x that of streaming from babune (so we are hitting the bandwidth cap on my system). The major gaps are at the same point, though here the downtime is greater. I wonder if we are hitting CPU limits on launchpad server side. I also don't have any idea of launchpad code hosting's current load, or whether there are other limiting factors between here and launchpad. What is also very strange is the 'ramp up' that is seen repeatedly. Where you get a severe drop, followed by a fast ramp, slow ramp, fast ramp, peak and then dropoff again. I'm also not sure what bzr version launchpad is running, I'm fairly confident that I'm connecting to bzr-2.0.2 on Babune. So it *could* be that just saturating my ISP's bandwidth because LP has so much more capacity, is causing all sorts of networking craziness. I'd like to test streaming from LP to babune, since that is a much lower latency connection, but I don't know how I would grab a graph of the bandwidth there. More graphs. This one is the bandwidth of downloading all of bzr from a freshly packed repository on chinstrap, rather than from bazaar.launchpad.net. 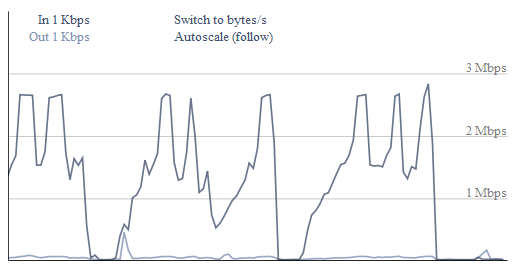 Note that while still a bit 'spikey' it stays much closer to peak bandwidth for the whole time. The other difference here is that I'm using openssh as my ssh provider, rather than paramiko. I'll upload one with paramiko in a second. So there are still a fair amount of variables. I'll try a copy of production's exact repo (rather than freshly packed) and see if this changes anything. This is connecting to chinstrap via paramiko. It seems a bit spikier, but the total download time is about the same. Note also that I think the X and Y axis should be identical for all the recent graphs. This next graph is 'get_stream()' from chinstrap using an 'lftp mirror' copy of bazaar.launchpad.net's bzr repository. Unfortunately there was a tiny data spike, which caused the Y axis to resize, but the X axis is the same. The peak seen in this graph is the same as the peaks elsewhere. So we again manage to hit peak bandwidth, but it is much choppier. This indicates that the thrashing we noticed before really does decrease throughput. We fixed size-on-disk by having the client recompress the stream. This is another chinstrap => local using the mirror of production. In other words, it doesn't change the signatures/repository/inventory or chk streaming, but it changes the text streaming to be done 'unordered' rather than trying to recompute the 'groupcompress' "proper" order. This is better for networking at least. The runtime dropped from 350s down to 260->290s. And most of the "creating new compressed block on-the-fly" lines are gone. I don't have a good feel for what this will mean client-side for final-disk size. As it will be trying to collapse groups, but it won't have the data in an optimal order. My bzr ping plugin says bzr+ssh://bazaar.launchpad.net/ is running 2.0.0.
machine showed the same results. from having a non-optimally packed source repo is another. > from having a non-optimally packed source repo is another. I'm just attaching the script I'm using on the client for testing. This is the 'no-op' client so that we hopefully are only showing the server's ability to keep the pipe full. Long term we need to optimize both sides. And make sure that the server keeps its end full, and the client is clearing out its end as fast as possible. But splitting the testing should make it easier to get there. The script is adapted from my work on testing memory consumption, so it depends on Meliae, etc. But we can easily strip that out. Which is a 31MB file. The whole transmission is very "peaky". I've also confirmed that it isn't just disk issues by running 2 times. 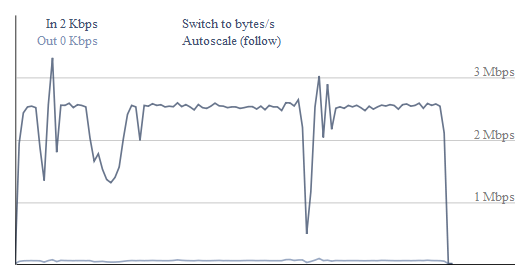 Anyway, you can still see that it cycles up and down near the bandwidth max, and occasionally drops off considerably. I do wonder if this is a network configuration issue, though. As I've seen downloads from Steam, etc, that are just a rock-solid 300kB/s. Or maybe it is just because it is going transcontinentally? may not keep as clean a buffer as needed ;). worrying about the server side at all. > may not keep as clean a buffer as needed ;). > worrying about the server side at all. So I did a bit more debugging, since I was looking at this code a bit while trying to address the os.write code. Anyway, it looks like the ssh process allows us about 1.6MB of in-transit data before it starts blocking. This was detected by having a canned request return a lot of bulk data, and then having a trivial client that just reads the response 64kB at a time. My network is still a bit strange, but I can see that the server-side claims to write as many as 30 64kB chunks that the client has not claimed to have read yet. This was done by breaking up a large request into 64kB chunks, and calling out.write() on each one, and timing how long it took, while at the same time, the local client reports when it reads 64kB. This used ssh's stderr multiplexing to get the messages on stderr locally. Which I'm sure isn't perfectly aligned between processes, but it should be at least close. Which I assume means that ssh is blocking waiting for some of the buffer to clear up. This means we have something less than 2MB of buffering that we get for bzr+ssh. (I assume this would be different with Launchpad's Twisted implementation.) Though it may also depend on the Window, etc settings. Anyway, it would appear that there isn't much to be done for bzr+ssh, since as near as I can tell, ssh is already handling the buffering for us. I wonder if it would help to decrease the 1MB internal buffer, so that we aren't too close to the limit of the ssh subprocess. Conceptually, that would allow us to multiplex a bit more. So that we don't wait and have the buffer empty before we then supply a huge content chunk that ends up blocking. reader blocks it. So Martin's 128kB comment fits. it on the wire, and we can keep producing more data. > it on the wire, and we can keep producing more data. > > it on the wire, and we can keep producing more data. its interactions up and down the stack tht we need to beware of. recipient it can optimise for us. I still feel like there is probably something about the connection to the London data center that needs to be investigated. It might be something with going over the Atlantic ocean, I don't really know. But I just tried a 'wget' of static content from kernel.org versus bazaar.launchpad.net, and the performance graphs are quite different. I did manage to find the 'free.fr' sourceforge mirror, and tried evaluating it. I actually get performance ~ on par with what I saw going to bazaar.lp.net. As a point of comparison, on Vincent's machine, I'm able to get up to 1.9MB/s download from both free.fr and bazaar.launchpad.net. As such it doesn't really seem like a raw-bandwidth issue. So while I think bzr probably *could* do something better, we really need to understand why *wget* isn't saturating the bandwidth first. I did take a Wireshark dump while using wget from bazaar.launchpad.net. I do see a fair amount of out-of-order and retransmission sections. Though my wireshark-fu is weak. I have a larger dump (15MB), but I figured just sending the first 3MB would probably be enough to see what is going on. Oh Launchpad, why must you mess up my formatting? Anyhow here's the output in a more readable form. Something definitely just got a lot better, possibly related to bug #582157. Which showed 275KB/s overall, and generally sustained 300KB/s. 'bzr branch lp:bzr' is also better, not as good as wget in this case, but better than it used to be. I may poke at this again, since it seems the TCP/IP issues are generally sorted out.